Todays competetive landscape requires your business to run without interruption. 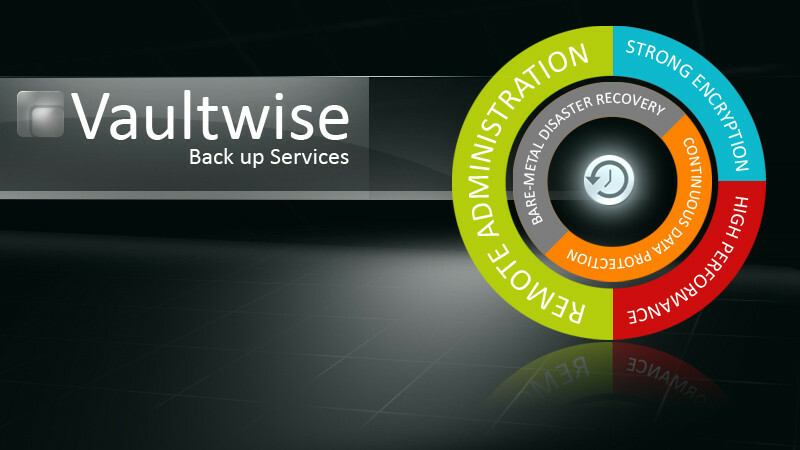 As a leader in the backup industry Vaultwise can help you achieve 24/7 uptime, even with a catastrophic failure. Our managed backup service provides sector level backups of servers for bare metal restores in the event of any disaster. With features like near-Continuous Data Protection, Multi-Platform flexibility, and Full Encryption your data is stored safely, and efficiently. After any disaster SSB allows you to restore servers directly from a disk-based backup. Unlike traditional backup software, there is no need to first partition your drive and install the operating system. Sector based backups increase speed and reduce overhead. Servers operate with minimal performance impact during backups by reading hard drives at a sector level and bypassing the file manager. Backups can usually be performed at anytime, even on busy servers.. The SSB Agent keeps a journal of disk changes. Incremental backups know what sectors on the disk changed before the backup operation even starts. This eliminates need for file-by-file or block-by-block comparisons during every backup..
For more information please feel free to contact us and visit Vaultwise.com for more details. Managed services with Utropicmedia means industry best-practices are at work. Systems monitored 24/7 by professionals that have been in this industry a minimum of 8 years.